You know, I kind of had an epiphany after I posted yesterdays cupcake adventure. See, as a review blogger, it's so easy to get up on my high horse and just bash everything. I mean, look at 2012, it seems like I've been disappointed by almost every product I have tried. However, when you bake (or do anything else creative), you have to get off that high horse and accept the fact that it's hard to make stuff. Funny thing is, me being me, I'm still critiquing myself the whole way through. I guess some things will never change... but I can change the content of this blog. Sure, we'll still do a quality ice cream review here and there, but it's time to get my hands dirty. It's time to embrace my construction cooking roots and start building my treat expertise one item at a time. And when we're not cooking (or scooping once a month a so), it'll be time to get back to drawing and creating. Yes, its a risk switching things up, but I hope enough of you will stick around for oddball geek projects like this. 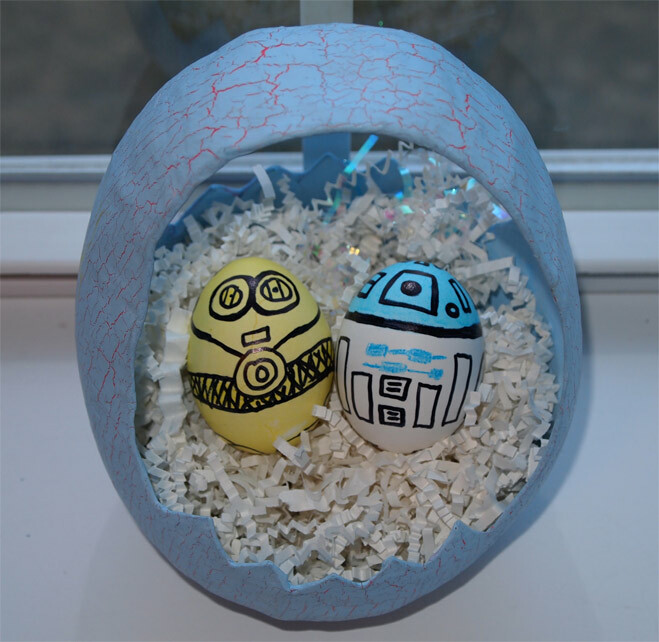 "These are not the eggs you're looking for"
Ok, so buckle up, it's gonna be a bumpy ride, I hope you come with me. I do like the idea of more treat creation posts but given today's date I'm not sure if this post is serious or a joke. it is a poor attempt at humor based on a semi-serious concept.... it was the best I could come up with since i did the faux blizzard last year. That and I was looking for an excuse to share my eggy creation. Those are some seriously cute eggs! Thanks!! My little boy is a big fan of "R2D"
"These are not the eggs you are looking for" would've been funnier. Even though this is a joke the concept behind you adding more posts of creations you've come up with would be a nice change of pace every now and then. good call, i changed it!